Pigeon Point Heritage Park is a 125 acre nature reserve on the southwestern coast of Tobago. 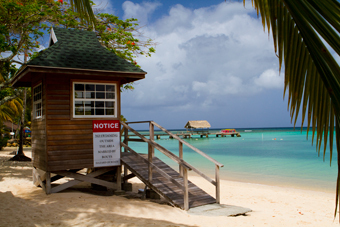 Home to the award-winning Pigeon Point Beach, this multifaceted facility has long been a defining feature of tourism in Tobago. Located just a few minutes from the ANR Robinson International Airport, this oasis is a wonderfully accessible escape from the life's busy pace. Here is some of the basic information you will need to plan a visit. Any further inquiry can be made by contacting us directly. What are the official beach hours? T&T citizens over the age of 65, in possession of a valid T&T ID card, are allowed complementary access. Lifeguards are on duty, daily, from 10am-6pm on Main Beach. There are no on-duty lifeguards on South & North beaches. Where is it safe to bathe? The main bathing area is demarcated on Main Beach. There should be no swimming outside of this area. What amenities are provided at the facility?